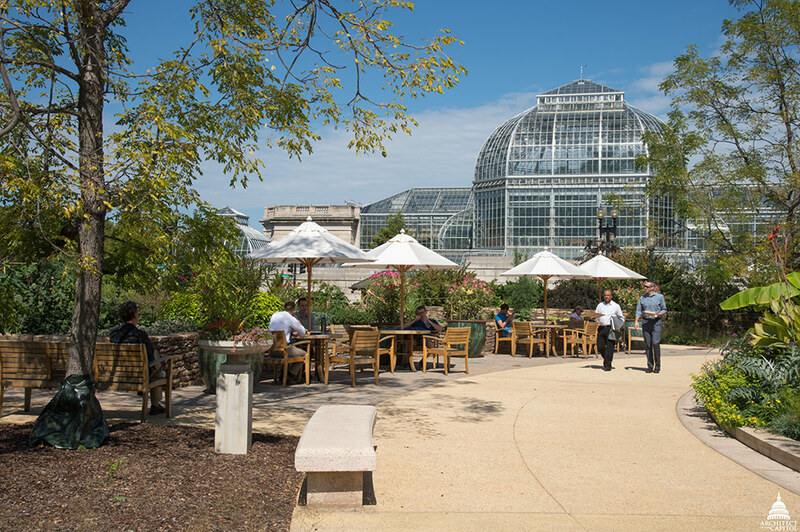 Bartholdi Park serves as a home landscape demonstration garden and showcases innovative plant combinations in a variety of styles and design themes. In 2018, Bartholdi Park achieved SITES Gold certification for its sustainability strategies. Created in 1932 when the U.S. Botanic Garden was relocated, the park was renamed in 1985 after the sculptor of the historic "Fountain of Light and Water" located at its center, Frédéric Auguste Bartholdi—later famous for the Statue of Liberty. Bartholdi Park serves as an area where visitors can learn the latest horticultural techniques for their home landscapes. The plantings are frequently updated to showcase new varieties, design trends and garden maintenance methods. The park is also a refuge—an island of green where visitors, office workers and a surprising diversity of birds and pollinators can find respite from the stresses of the city. Secluded benches offer quiet shade in the summer and sheltered sunlight in the winter. In warm weather, the splash of the fountain rhythmically underscores the chirps of nesting birds and the drone of busy insects. In every season, the colors and textures of the plants and flowers are exhilarating. The U.S. Botanic Garden Administrative Building is also located in the park. 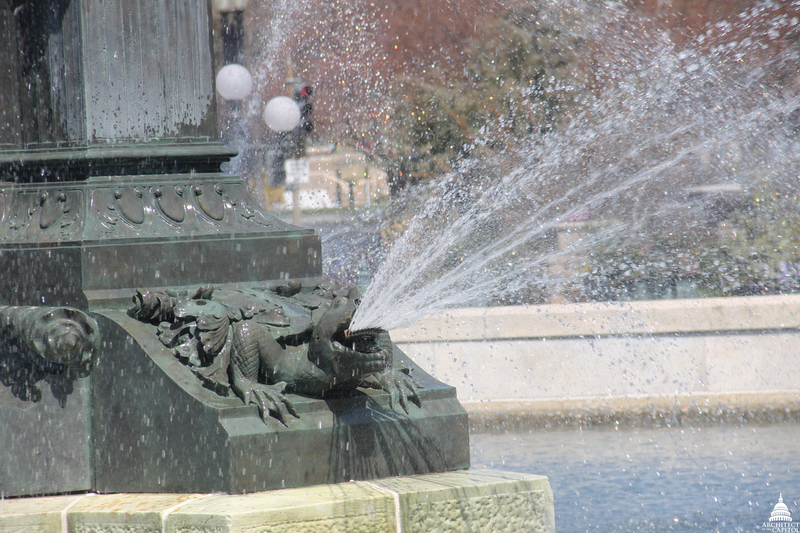 The cast-iron Bartholdi Fountain, painted to look like bronze, weighs more than 15 tons and is 30 feet high. It was intended to be an allegorical representation of water and light, designed in three identical sections with classical forms and symbols. Turtle-like aquatic monsters and large shells surround the base. The pedestal holds three sea nymphs that seem to hold the large basin, which is actually supported by the central column. Above the basin, three youthful tritons playfully hold out seaweed. Water spills from a crown at the very top into the upper basin, while jets near the bottom shoot from the mouths of fish and turtles. 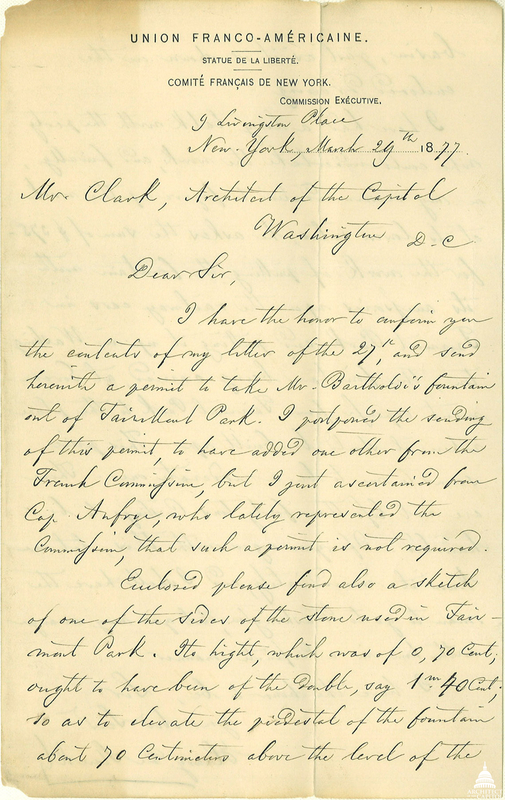 It was originally lit by 12 gas lamps, making the fountain one of the first nighttime attractions in Washington, D.C.
Letter from Olmsted to Clark. 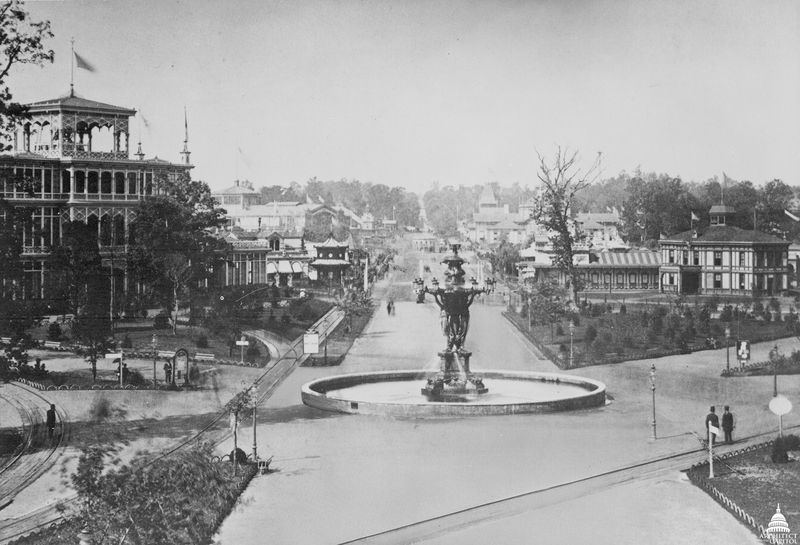 The fountain previously stood at the 1876 Centennial Exhibition in Philadelphia’s Fairmont Park before it was purchased in 1877 by the United States government for $6,000 (half of its estimated value) at the suggestion of landscape architect Frederick Law Olmsted, Sr., who was redesigning the Capitol Grounds at the time, to Architect of the Capitol Edward Clark. It was placed on the U.S. Botanic Garden grounds, which was then situated in the center of the National Mall. 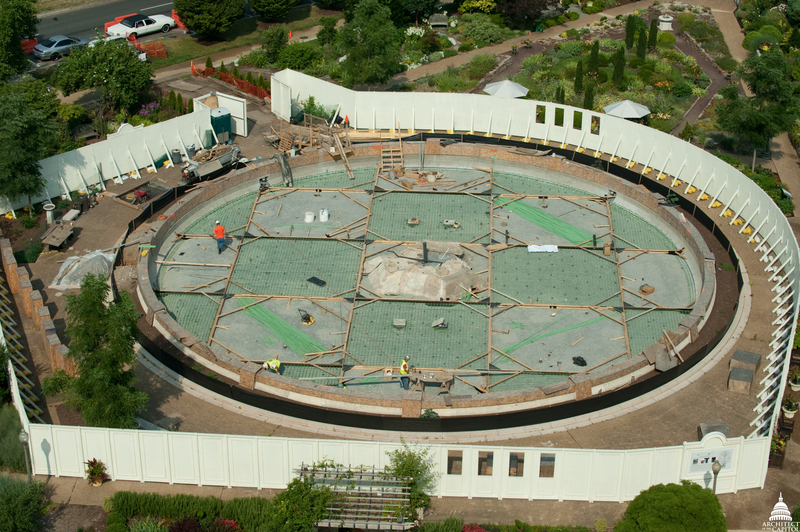 During the 1927 relocation of the Botanic Garden, the fountain was dismantled and stored. In 1932, it was re-erected in its present location. Battery-powered electric igniters replaced the gas lamps in 1881. 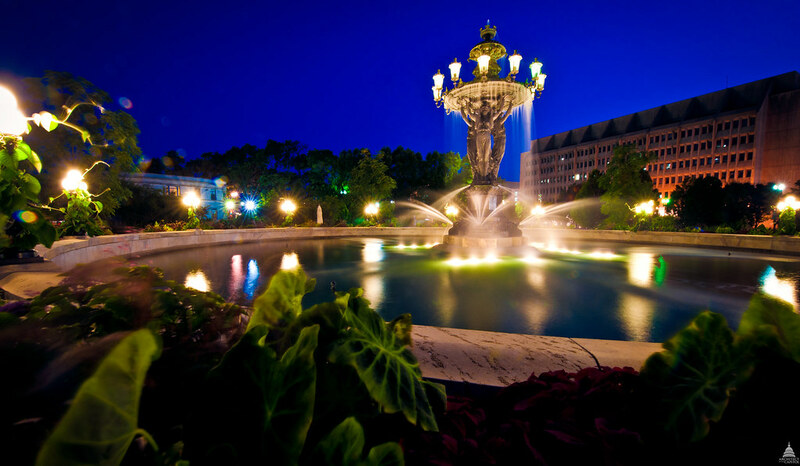 The lights surrounding the large basin were added in 1885, and the fountain was completely electrified in 1915. The Bartholdi Fountain was restored in 1986. The rusted supporting bolts and rods and the plumbing and wiring were replaced. Dozens of layers of paint were sandblasted from the cast-iron surface, which was then given a new protective coating. The basins were repaired and leveled so that the water now falls evenly. The topcoat of paint was renewed in 1996. 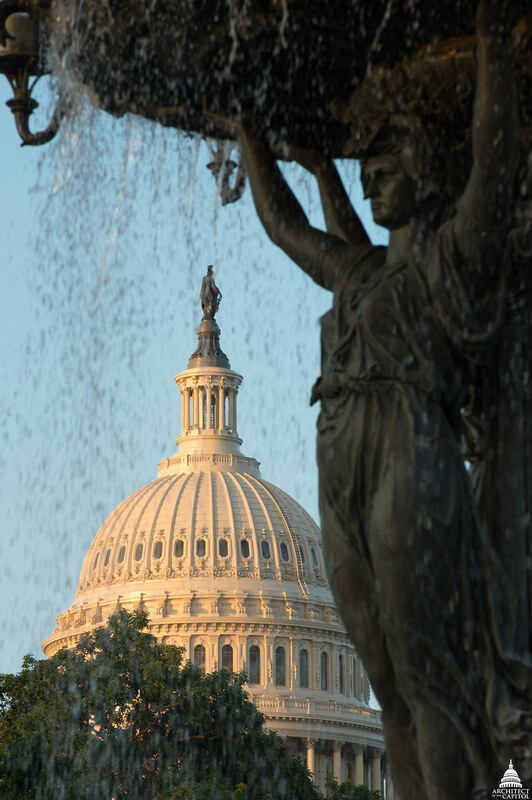 From 2008 to 2011, the Architect of the Capitol performed a complete restoration of the fountain and its basin. 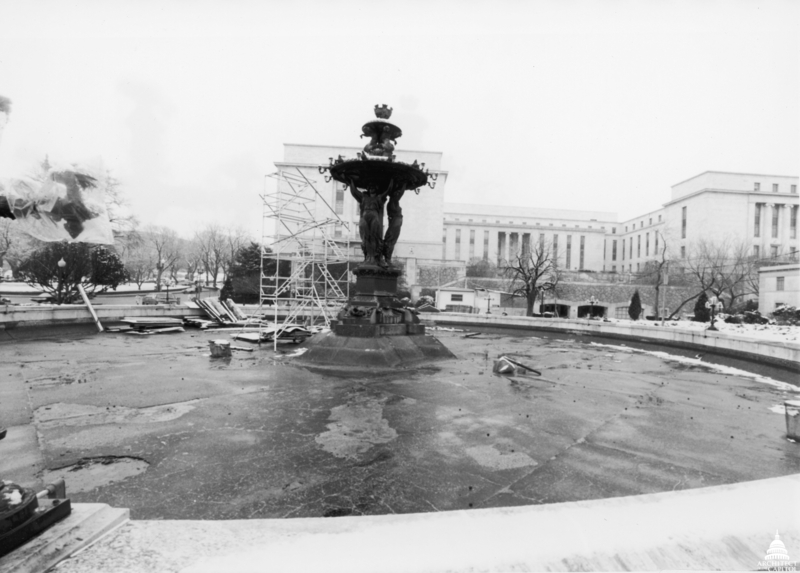 The restoration was the fountain’s first complete deconstruction and restoration since 1927. 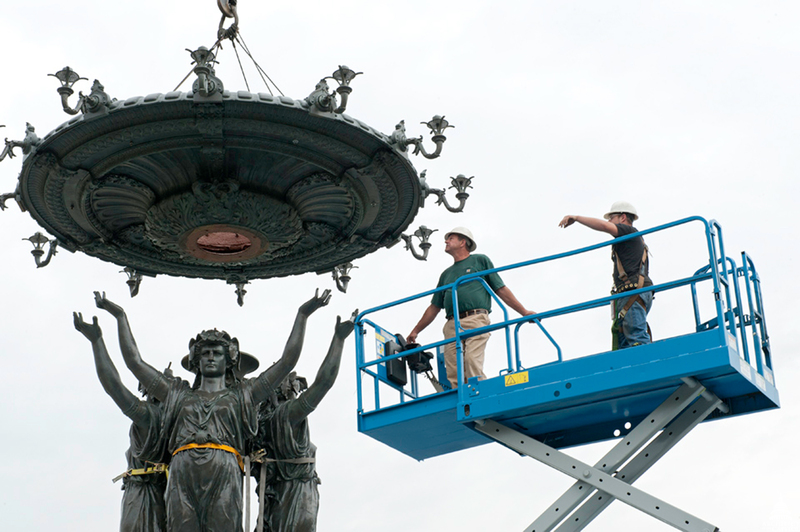 The restoration was commissioned to address corrosion and excessive wear to the fountain and included repairing deteriorated metal, replacing interior mechanical and electrical components and replacing the lighting with new energy-efficient fixtures true to the style of the fountain’s original glass sconces. 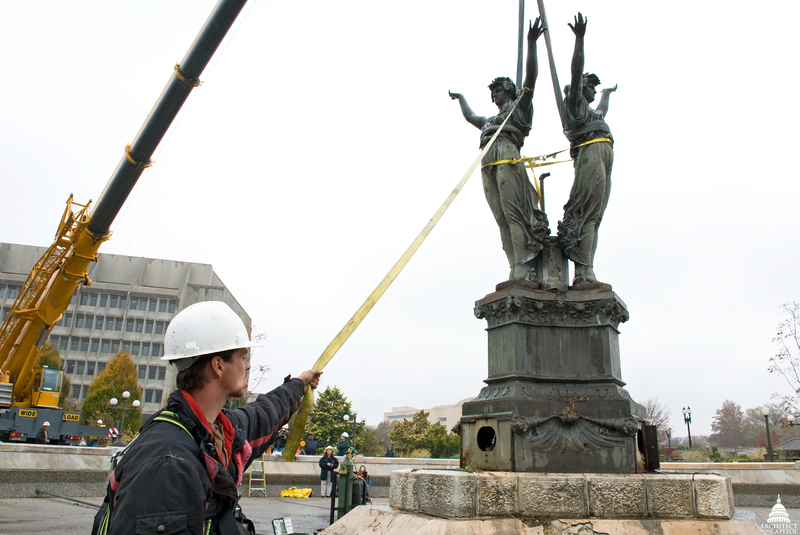 The fountain also received modern improvements such as energy efficient pumps and motors, a new water treatment and filtration system and a zinc coating to preserve the original cast-iron of the fountain that dates back to 1876. 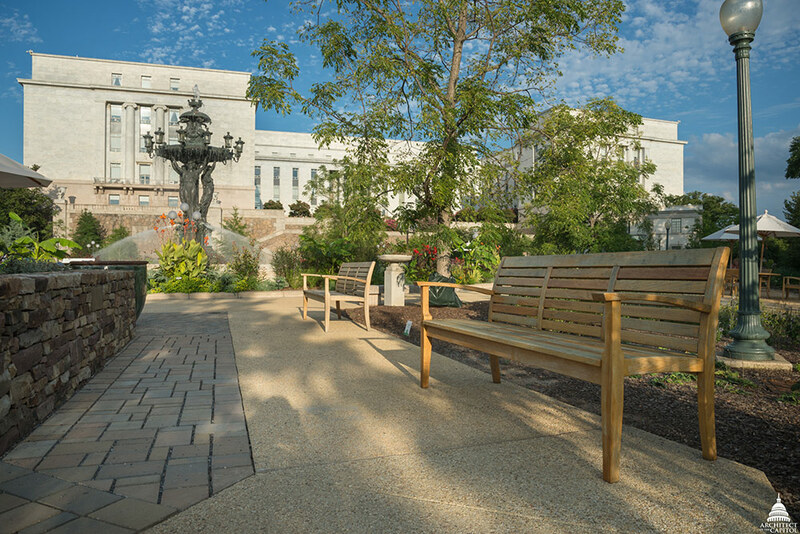 In 2016, the park was renovated to include accessible pathways, improved access to the American Veterans Disabled for Life Memorial, increased safety via new lighting, improved stormwater collection, updated irrigation, new plantings, and restoration of the historic small fountain at the northwest corner.